Hello! 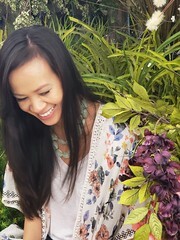 I am Yvonne and I am a graphic designer born in Vietnam, raised in South Dakota and currently residing in Virginia. I have always been fascinated with all aspects of design, whether it is fashion design, interior design, web design or graphic design. I enjoy the simple things in life and I am truly blessed to come home to the most sweetest little 2 year old. I work in a corporate world as a web graphic designer during the day and full time mommy at night (my favorite job) This blog is simply me blogging on the simple things that inspire me creatively and hopefully others.